Stocks are lower this morning on no real news. Bonds and MBS are down as European bonds continue to sell off. European bonds have been selling off as fast money gets caught on the wrong side of the boat. This is pushing up Treasury yields, which should be moving down based on some of the economic data lately. There is a lot of economic data this morning. Initial Jobless Claims fell to 262,000, the lowest reading in 15 years. The ISM Milwaukee index fell to 48.08. The Bloomberg Consumer Comfort Index fell to 44.7 and the Chicago Purchasing Manager Index rose to 52.3. The Employment Cost Index rose .7% in Q1. Wages and Salaries increased .7%, while benefits increased .6%. On an annualized basis, wages and salaries were up 2.6%, while benefits were up 2.7%. 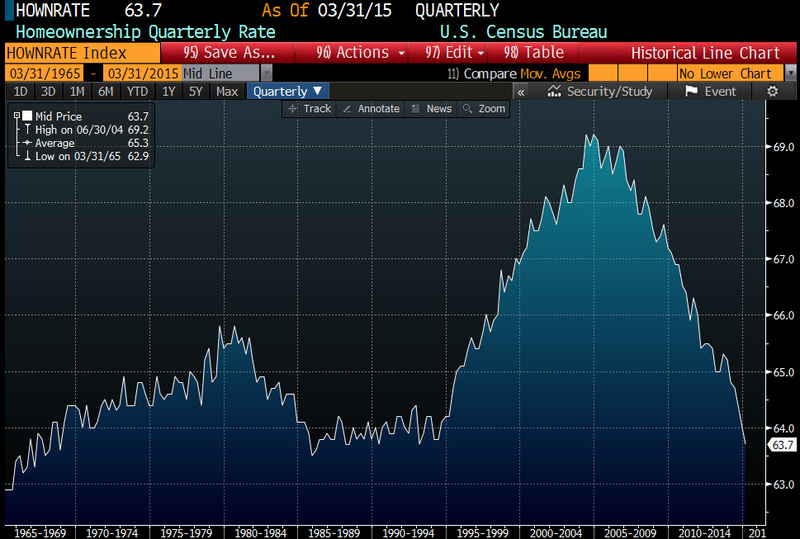 This is a big jump from the fourth quarter reading of 2.1%, and the average over the past few years of around 2%. One data point does not make a trend, but economically this is encouraging – wage growth has been a long time coming. Personal Income was flat in March, however compensation was up .2%. Personal spending rose to 0.4%, and the savings rate dipped slightly to 5.3%. The savings rate has been trending upward however, as people use some of the added income to pay off debt. The increase in spending is an encouraging data point. Inflation remains low, using the Fed’s preferred inflation measure, personal consumption expenditures. On a year-over-year basis, the core number is up 1.3%, well below their 2% target. 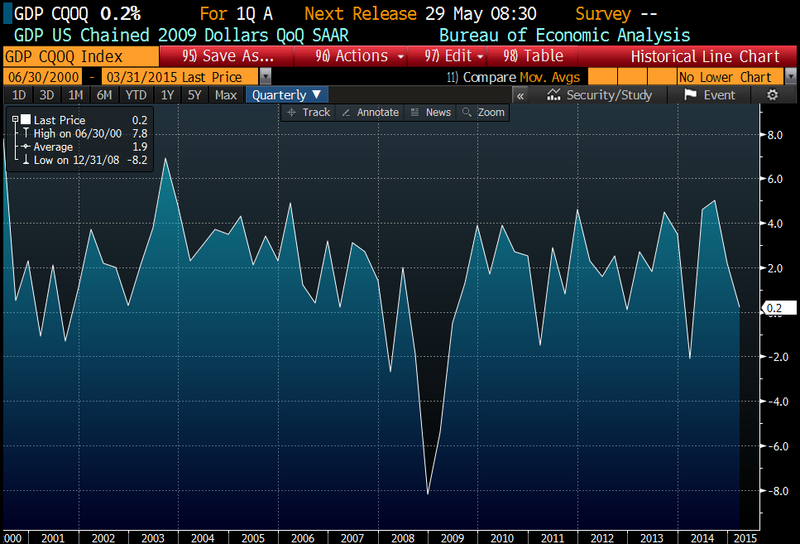 Given the weak Q1 GDP number and the weak inflation numbers, I find it hard to imagine the Fed moving in June. The FOMC statement was pretty bland, and we didn’t see much of a reaction. The slowdown was attributed largely to “transitory factors.” On rate hikes: “The Committee anticipates that it will be appropriate to raise the target range for the federal funds rate when it has seen further improvement in the labor market and is reasonably confident that inflation will move back to its 2 percent objective over the medium term.” Given unemployment is back at normal levels, they are probably looking at wage growth as their key metric. Household formation increased at an annual rate of 1.5 million in Q1, even as the homeownership rate dipped. This is good news for landlords, however it isn’t spilling over to residential construction yet, with housing starts still mired about 70% of normalcy. Markets are subject to some push-pull this morning with stronger data out of Europe and weaker data out of the US. Bonds and MBS are down. Bonds are getting roughed up this morning after Germany reported inflation that was higher than expected. The German Bund is trading at 26.3 basis points, up 10 basis points this morning. This has pulled US Treasuries lower. Note the Fed rate decision is scheduled for 2:00 PM EST. Stocks on the other hand are dealing with a huge miss on GDP. The advance estimate came in at +0.2% for the first quarter. The Street was already expecting weakness due to the weather, however the number still missed the +1.0% street estimate by a wide margin. Consumption growth fell to 1.9% from 4.4% in the fourth quarter. Investment fell from 3.7% to 2.0%. Government spending improved from -1.9% to -.7%, although that was driven by decreases in defense and increases in non-defense spending. Finally, the trade balance decreased a little. This number is going to be subject to two more revisions, and I would expect this number to be revised upward. Most economic data do not suggest that growth ground to a halt in Q1, just that it slowed down from Q4’s +2.2%. I suspect this will seal the deal that the first rate hike will be in September, not June. Mortgage Applications fell 2.3% last week, as purchases were flat and refis fell 3.7%. Pending Home Sales rose 1.1% in March, more or less in line with estimates. Financial professionals can expect more invective thrown their way. Bernie Sanders (I-VT) is throwing his hat in the ring. Sanders, a socialist, will run on the Democratic ticket and try and pull Hillary to the left. Markets are higher on no real news. bonds and MBS are down small. Not much in data this morning. The Markit PMI numbers fell slightly in April from March. I think we can officially scrap “the weather did it” excuse for weak numbers. The FOMC meets this week, and this will be the last meeting where rate hikes are not on the table. It won’t contain any new forecasts and it won’t have a press release. It should be a nonevent. This week contains some important economic data (especially for the Fed). We will get the advance estimate for Q1 GDP, Personal Income and Personal Spending, and the PCE deflator (the Fed’s preferred measure of inflation). Note that the first Friday of the month is this week, but the government is delaying the jobs report until next week. The GDP report is going to be weak – the Street forecast is +1.0% – however personal income could move the bond market if we start seeing wage inflation. The PCE deflator will be important on the other side – if inflation remains well below the Fed’s target they have an excuse not to move. Finally, we get construction spending and the Case-Shiller index. The battle between Quicken and the DOJ is heating up. Quicken CEO Dan Gilbert spoke truth to power on Friday: “This is what happens when you dare to stand up for justice and the truth to the Department of Justice,” Gilbert said on a conference call Friday evening with the Free Press. “This was an attempt to embarrass us and continue to pressure us to write enormous size checks to settle (allegations) to make them go away, and to admit things that did not occur.” The industry is rooting for Quicken on this one – believing the government is systematically making mountains over immaterial clerical error molehills in order to squeeze more 8 and 9 digit settlements out of the industry. Of course, then the government scratches its head wondering why credit is tight, especially at the lower FICO scores. Is it time to start pushing the housing recovery forecast out to 2017? I hope not. At least one economist thinks 2015 is going to be good. Stocks are lower on overseas economic weakness. Bonds and MBS are flattish. Initial Jobless Claims came in at 295, a little higher than expected. 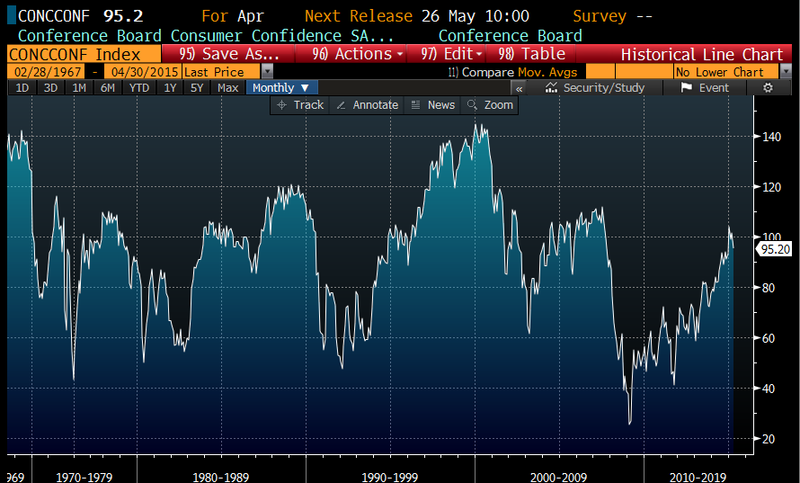 The Bloomberg Consumer Comfort index slipped to 45.4 from 46.6. New Home Sales dropped to an annualized pace of 481k in March, from 543k in February. This was a big miss – the Street was at 515k. We heard from homebuilder D.R. Horton yesterday. They beat expectations, but the margin and revenue guidance was on the light side, so the stock was sold off. D.R. Horton is very exposed to Texas and has yet to see any evidence of an slowdown in that economy. Horton was encouraged by the demand and is seeing strong growth in its Express brand, which is targeted at the first time homebuyer. The downside is that the margins in Express are lower. Interesting stuff on the state of part-time workers. US part-time employment is reaching historical norms and that indicates the slack in the labor market is going away. Interestingly they polled workers who put in 30 hours a week or less. Of those people, a third were happy with their hours or wanted to work less. Only 23% wanted a traditional 40 hour a week job. Of those working more than 30 hours, about a quarter wanted to work less. Punch line: as the slack is taken up, wages are going to have to go up. Which means the Fed is more likely to mover sooner rather than later. The Clinton Foundation is under the microscope right now, and the New York Times has a piece about how the State Department approved a Russian nuclear deal after a big donation to the Clinton Foundation. WaPo has a piece on the foundation and Bill Clinton’s speaking fees. There is supposedly a tell-all book coming out on the Clinton Foundation as well. Whatever comes out of it, the Democratic Party is all-in on Hillary and will dismiss any revelations as partisan poo-flinging regardless of the merits. Stocks are up this morning as struggling Greek banks get a bit more breathing room. Bonds and MBS are down. Mortgage Applications rose 2.3% last week, according to the MBA. Purchases were up 5% while refis were up .6% and accounted for 56% of all loans. Existing Home Sales rebounded to 5.19 million in March, according to the National Association of Realtors. Inventory remains tight at roughly 4.6 months (6 months is considered “balanced”). The median home price was 212,100, which is 7.6% higher than a year ago. The first time homebuyer was 30% of all sales, which is starting to inch up. More inventory and more construction is needed to see these numbers improve. Cash sales as a percent dropped to 24% as professional investors exit and “real” buyers return. 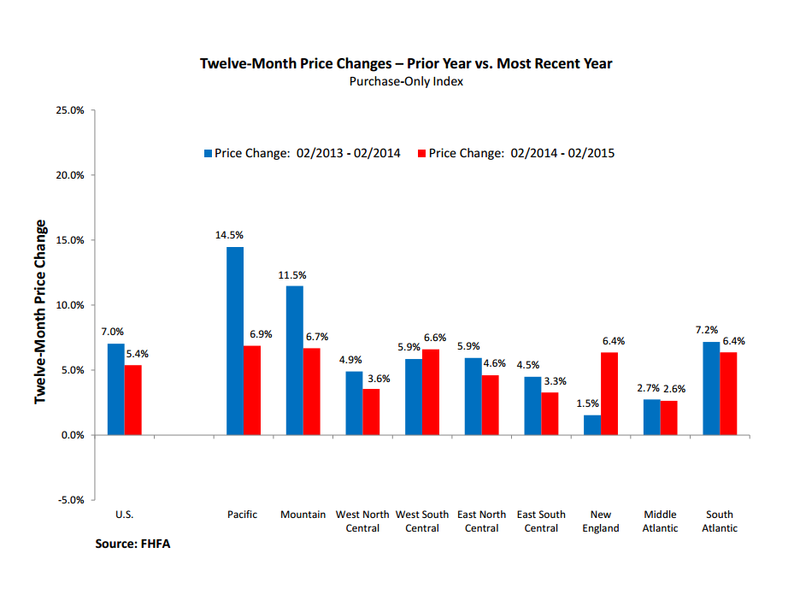 The FHFA Home Price increased .7% in February, well above the .5% expectation. On a year-over-year basis, prices were up 5.4% and we are now within 3% of peak levels, which puts it roughly at January 2006 levels. If you take a look at the geographic returns, the West Coast is slowing down from its torrid pace in 2014, however it is still strong. The bright spot seems to be the turnaround in the Northeast, where home price appreciation is finally higher than the national average. For a long time, Southern California and New England have been polar opposites, with a red-hot market out west and an ice cold market in New England. The big Northeast judicial states appear to be finally cleaning out the inventory of foreclosed homes, which has been weighing on the market. If you were wondering how Treasury views Fannie mae stock, look no further. Senator Chuck Grassley (R., Iowa) sent a letter to Treasury asking how the government was going to treat Fannie Mae shareholders now that taxpayers have recouped their bailout funds. Treasury’s response – that was not a “loan” that can be paid back – it was an “investment” that should earn a huge return given the risk that taxpayers took. In other words, this will come down to litigation between Fannie Mae shareholders and the government and Fannie Mae stock is a litigation lottery ticket. The German Bund is the “short of a lifetime” according to Bill Gross. Separately, Paul Singer of Elliott Management characterized the sovereign debt bubble as on par with the subprime bubble. The Fed inflated the stock market bubble which subsequently burst, then inflated a residential real estate bubble to ease the pain of the burst stock market bubble, and then inflated a sovereign debt bubble to ease the pain of the burst residential real estate bubble. As I have said before, stock prices are pricing in a 100% probability that the Fed can raise rates with no one blowing up. Not sure that is a good bet. It also raises on more thing to think about – Hillary’s most formidable opponent will not be the GOP candidate – it will be Janet Yellen.